2a Shape, advance and accelerate a shared vision for empowered learning with technology by engaging with education stakeholders. 2b Advocate for equitable access to educational technology, digital content and learning opportunities to meet the diverse needs of all students. 2c Model for colleagues the identification, exploration, evaluation, curation and adoption of new digital resources and tools for learning. Educators should seek opportunities to learn and share their knowledge and understanding of new technologies. It is also important to seek equitable access to digital content for each student. 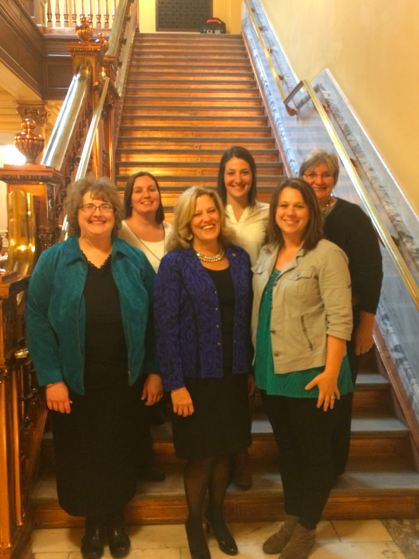 Fellow colleagues and KTOY nominees at the Statehouse with Sen. Vicki Schmidt. During my first semester of graduate school, I was challenged to evaluate three different educational blogs that I might use to gain knowledge and understanding for my practice as a science educator. After researching a variety of different blogs, my assignment was to create a podcast review of the three blogs. This was a foreign idea for me because up until then, I had never listened to a podcast let alone create my own. Using Audacity and an mP3 encoder called Lame, I set off recording my own evaluations of the three blogs. Although challenging, I had a lot of fun and it forced me to be creative. I had to find and upload sound bytes for my introduction as well as learn to mix and edit short segments of my voice. I believe this assignment fits in the "Leader" category because I was providing meaningful evaluations of educational resources. Introduction to Educational Research prepared me to take a leadership role to influence change in my school. In a series of extensive steps I learned the characteristics of qualitative and quantitative educational research. As partial fulfillment for this class I was assigned the task of identifying an issue to study closer. Since SHMS has a teaming philosophy I wanted to use data available to our team. I chose to focus on why certain students are perpetually on the "F" list despite our teaming approach. A copy of my research proposal is below. Recently, I completed a training for provided by Adaptive Schools for my school district. "The goal of Adaptive Schools Seminars is to develop the collective identity and capacity of organization members as collaborators and inquirers and leaders," http://www.thinkingcollaborative.com/seminars/adaptive-schools-seminars/. Our school district supports a teaming approach for its teachers. This training provided us norms and tools for positive productive meetings and relationships. I have learned the skills I need to be a facilitator of a meeting as well as how to not be a facilitator and meet the other needs of a group through dialoguing, charting, paraphrasing, and holding discussions. Below is my certificate of completion.